Other films this year will have to try hard to match the explosive power and masterful direction of Denis Villeneuve’s “Prisoners”. His film sneaks up, messes with you head and leaves you breathless. Allow it. Yet on the surface, the plot sounds like an ordinary police procedural: Keller Dover’s (Hugh Jackman) six-year-old daughter, Anna, is missing, together with her young friend. Cops investigate and a manhunt ensues. First evidence leads to a mute young guy (Paul Dano) who was driving the decaying RV that the girls played on earlier in the day. But there’s nothing ordinary about the way screenwriter Aaron Guzikowski transforms this simple whodunit into a multilayered, unforgettable thriller. And there’s nothing ordinary about the way Villeneuve merges all the elements into a movie of startling power and intimacy. Still, it’s the people in the story who draw you in. Villeneuve couldn’t ask for better actors to fill these tricky roles. Jackman, best known for his role in the X-Men series meets every challenge of a role that calls for subtlety and sureness. This may be his most potent two and a half hours onscreen. Do you want to see screen acting at its riskiest and most riveting? Watch Jackman (I predict an Oscar nomination for his terrific performance but that’s another story). And Jake Gyllenhaal as the lead investigator is outstanding. And Maria Bello as Jackman’s wife gives a blazing performance that goes from happiness to heartbreak in a matter of seconds. All the supporting actors excel. Melissa Leo doesn’t have enough screen time but she’s unforgettable, and Paul Dano will haunt your nightmares as Alex, the suspect the cops dismiss and Jackman comes to focus on. But it’s the process that pins you to your seat, not just the whodunit itself. Villeneuve is a powerhouse filmmaker (see “Incendies” for more proof) who takes you up in ways you don’t see coming. 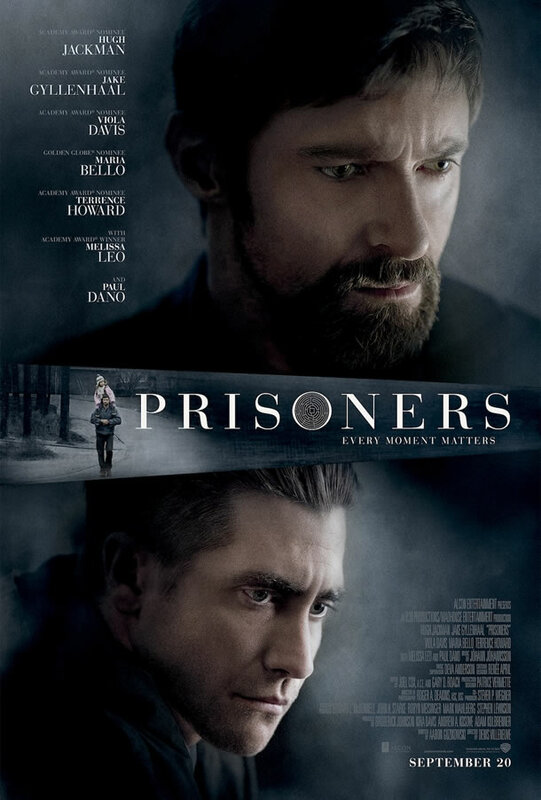 I’ll say no more, except that “Prisoners” is a tense, absorbing thriller that hits your right between the eyes. And I loved every second of it. It’s easily one of the best movies of the year. Ouf I wanted to read your review before I go though I wasn’t really reluctant as it looked like a good one! Now I’m definitely going, thanks Anis! Let me know what you think once you see it! Indeed, It’s one of the best movies! 2 hours and a half of suspense and trying to understand what happened! One of those movies that keep you on the edge of your seat! Marvelous! The direction of the movie is brilliant. I was most touched and captured by the story of Bob Taylor, its positioning in the plot was genius.